Groupauto has already set its sights on 2014 and its AutoCare conference. Next year’s event for its independent garage members will not only see it brought forward two months to April, but also a move to a new venue. The switch from Stoneleigh, Warwickshire to the Telford International Centre, Shropshire is being made on the back of the successful motor factor conference earlier this year. Jim Mazza, Managing Director at Groupauto, said: “The move from Stoneleigh came as a result of the positive feedback from members and suppliers to the motor factor tradeshow at TIC in October and the opportunity the venue gives us to bring all daytime elements of the event together into a single building. 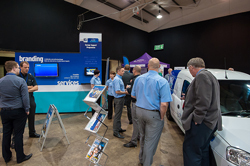 The format of the AutoCare tradeshow will be in similar vein to the motor factor event with an exhibition, which already has more than 80 approved suppliers signed up. There will also be a conference for independent garage members to keep abreast of developments in the industry, concluded by a gala dinner where the garage of the year is announced.